optimism by most political parties. Minister of Finance Pravin Gordhan delivered his mid-term budget policy speech before the National Assembly on 27 October 2010. The speech was met with cautious approval by most political parties. The Democratic Alliance stated that it agreed with Gordhan that the country’s economy is not yet out of the woods after the global financial crisis of 2008, but that ongoing efforts to improve performance in the public sector, flush out corruption, and strive for more foreign investment, will produce the economic prosperity that all South Africans hope for. The Freedom Front Plus said the revised growth rate, from 2.3% to 3% for the year, was a positive development, while the African Christian Democratic Party announced that, while it approved of the speech, it would continue to monitor the feasibility of the new economic growth strategy. 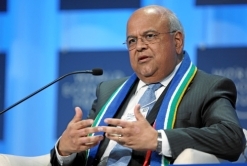 Although the United Democratic Movement acknowledged improvement in some economic indicators, it said that South Africans should not prematurely celebrate the end of the recession, and agreed with Gordhan that the economic outlook was still harsh. The Independent Democrats also voiced reservations. Although the party conceded that issues such as upwardly adjusted annual growth rate and the lower budget deficit were encouraging, it remained concerned about rising unemployment, and expressed its disappointment that the minister had not given more details regarding plans to tackle the situation. It also singled out public debt as a concern, naming energy utility Eskom as an example, as well as the government’s reluctance to make a statement on the wage subsidy for unemployed youth, which, it said, could have a huge impact on job creation. The Inkatha Freedom Party was pleased with the increased budget for health services and infrastructure, the allotment for drought relief, and plans for better financial management in service delivery. It also recognised the challenges that still lay ahead, such as lack of jobs. The Congress of the People also noted a steady rate of inflation, lower interest rates, and the budget deficit which was better than expected. It was disappointed that no strategy had been announed to weaken the strong rand, and also expressed concern at the lack of forward planning in terms of job creation and faster economic growth. Former President Mandela once said: “After climbing a great hill, one only finds that there are many more hills to climb!” As a youthful nation, we have had our fair share of hills to climb. Our successful hosting of the World Cup earlier this year is surely proof that no hill is too steep. As we move out of the depth of the greatest recession since the 1930s, we find yet another hill facing us – the highest, perhaps, we have yet had to climb. This is the creation of jobs and the reduction of poverty. Honourable Members, today is the birthday anniversary of Oliver Tambo, who dedicated his life to these goals. In taking this struggle forward, Cabinet has this week released details of a new growth path that sets out a vision and outlines key areas where jobs can be created. This is an agenda for collective action by the state, business, organised labour and civil society – in fact all South Africans have an interest in energising and activating the growth path. Members of the House will know that the details of the new growth path have been under intensive discussion since this time last year. A more inclusive approach to development and creating jobs has been at the forefront of the work of Parliament and many of its committees this year, and it was the central theme of NEDLAC’s Annual Summit last month. Our central goal is unequivocal: we have to accelerate growth in the South African economy, and we have to do so in ways that rapidly reduce poverty, unemployment and inequality. In February this year, we spoke of our shared humanity, our generosity, our resilience and our capacity to deal honestly with each other. We said these attributes were our most precious national asset, an asset that gives us formidable capacity to fight adversity, to find common ground and to move forward. Now is the time to demonstrate it. The challenges before us demand it. We have done well, but it is not good enough. We know our challenges. It is time to be impatient with ourselves. The time for talking about our challenges is over. The challenges that we know so well – poverty, unemployment, deteriorating infrastructure, delays in services – demand our urgent responses. Our communities have been very patient. They want this economy to create jobs; they want faster and better delivery of public services. South Africans, all South Africans, those who are poor and those who are privileged, want economic growth. But not just any growth. We want economic growth that creates opportunities for meaningful participation, not only for ourselves, but for our neighbours, not only for ourselves, but for our sons and daughters. It is my privilege to introduce the Medium Term Budget Policy Statement on behalf of the President and the Cabinet, Honourable Speaker, and to encourage the House and its committees to engage fully with its proposals as part of the more wide-ranging discussion of the central economic, social, financial and developmental challenges of our time. I need to stress, Honourable members, that the design of a growth strategy is the first step. Our next challenge is its implementation – aligning our policy and programmes, managing infrastructure project contracts, supporting accelerated business investment; actually delivering on the outputs and activities that are now documented in outcome statements, delivery agreements and strategic plans for every government department, every public entity, every state-owned enterprise, every municipality. All of us, every minister is committed to this. And we know that we can deliver on a plan, on time and on budget. We know that we can mobilise all South Africans behind a major project. In the midst of a global recession, we brought a special brand of South African magic to the television screens of the whole world. Billions of people around the world watched South Africa perform at its best, and we hosted 350 000 enthusiastic visitors. And so we know what it feels like to work together as a nation, to share a collective pride in saying “Ke nako! It’s our time! We can do it!” Of course, we also know that economic development is not an event, it is a process which requires sustained effort and continuous engagement, unfolding over many years. Honourable Speaker, the 2010 Medium Term Budget Policy Statement begins with a reminder that development is not about numbers, it is about people and improving the quality of their lives. Our third progress report on the Millennium Development Goals (MDGs) has recently been published, as a collaborative effort between Statistics South Africa and a range of civil society organisations. It is a timely reminder that while we can report steady progress on several fronts, we are lagging well behind the targets in others. We are likely to achieve the 2015 MDG targets for reducing extreme poverty, for access to water and sanitation and in providing school opportunities and achieving gender equity in education. But on critical health indicators, such as maternal and child mortality, and HIV and TB prevalence, we are not on track to achieve the targets. The quality of many of our schools falls short of acceptable standards. On the broader economic indicators, we still have a very unequal distribution of income, and too few South Africans have jobs. So we have to place health care and the creation of national health insurance, education, employment and the requirements of the growth path at the centre of our policy framework for the period ahead. This is in part about expenditure allocations, and it is also about how we manage public service delivery. It is about taking forward the work of Minister Chabane’s performance monitoring and evaluation department, and various interdepartmental teams who have developed the specific outputs and targets that are now embedded in twelve sets of delivery agreements covering national, provincial and local government responsibilities. These commitments and priorities have already influenced departmental planning and budgeting. Examples of existing spending programmes that relate to each outcome area are provided in the MTBPS, and will be elaborated in more detail in February next year. We are making our policy priorities and service delivery goals more measurable and more exact. We are strengthening our capacity to root out corruption and waste. We are making it possible for members of this House and ordinary citizens to see the links between the activities and projects of government departments and service delivery in our communities. Tourism and selected services sectors. Government’s new growth path provides the basis for coordinated policies and programmes across the state, and reinvigorated dialogue and cooperation among social partners. This is what accountability means. Honourable Speaker, South Africa was recently ranked first amongst 94 countries in the International Budget Partnership’s Open Budget Survey, which assesses the degree to which governments provide sufficient budget documentation to allow for public participation, understanding and oversight in national budget decision-making. The challenge before this House, and indeed all South Africans, is to strengthen our capacity to use this information to improve oversight, to improve accountability, to improve service delivery and thus to improve the pace and quality of our social and economic progress. Before returning to these development challenges, Honourable Speaker, allow me to comment briefly on developments in the global economy. International trade and output have started to grow again after the severe recession brought on by the financial sector crisis in developed countries. Fiscal and monetary policies remain broadly expansionary, but growth remains fragile, especially in major developed economies where employment has yet to recover and debt levels continue to rise. After declining by 0.6% in 2009, the world economy is expected to grow by 4.8% this year, which is considerably stronger than was expected at the beginning of the year. China remains the primary engine of world growth as its economy continues to be driven by rapid industrial expansion, urbanisation, and modernisation. India and Germany are also contributing significantly to global growth. There are signs that this recovery has slowed since mid-year. In the US, the Federal Reserve Bank has indicated that additional stimulus measures may be needed to prevent deflation. China has taken steps to tighten policy to prevent its economy from overheating. Last weekend’s meeting in South Korea of G20 finance ministers and central bankers drew attention to the risk of increased protectionism and disjointed actions by countries seeking to gain trading advantages by weakening their currencies. At the same time, countries with high fiscal deficits are obliged to reduce their deficits and stabilise debt levels through fiscal consolidation plans, phased in over time frames that are specific to the conditions of each country. The G20 proposes stronger multilateral cooperation, focused on structural reforms to sustain global demand, foster job creation and increase growth potential, while completing financial repair and regulatory reforms without delay. It is uncertain how these international cooperation efforts will work out, and so many countries share the same policy challenge – finding the right balance between measures taken jointly with other nations, and steps aimed at protecting national interests. It is clear that the rebalancing of global trade, consumption and investment patterns, increases in spending in surplus countries and decreases in deficit economies, in ways that are consistent with current account and fiscal sustainability norms, will take many years, and indeed rapid rebalancing would be highly disruptive. To understand the complexity of this restructuring, Honourable members, we need to appreciate that the decreases or increases in consumption or investment that may be required in specific countries, have implications for production in other countries, which will in turn impact on investment elsewhere, leading to further shifts in trade patterns. These inter-connected changes in economic activity bring real opportunities for growth and a redistribution of global income and welfare, but they are not correlated in predictable ways with exchange rate movements. The current global coordination efforts are therefore focused also on new sources of growth, longer term trade development and a more stable financial system. In early November, President Zuma will join other G20 heads of state in seeking a common framework for re-shaping the global economy, and addressing the challenge of aligning divergent national interests within a multilateral cooperative vision and a plan of action. South Africa’s view is that shared long-term goals and well-sequenced reforms are more likely to succeed than unilateral or protectionist steps. In this context it is important to note that Sub-Saharan Africa is well positioned to benefit from the improvement in global demand. Africa has largely escaped the negative overhang of high household debt and weakened banking systems that has been felt in many other regions. However, slow growth in developed countries has reduced the flow of remittances to low-income countries and rising debt in core markets could impact negatively on development assistance. Nevertheless, low global interest rates, high commodity prices and strong Chinese demand for Africa’s exports provide positive economic boosts, particularly in countries that have undertaken structural and budgetary reforms. Growth in Sub-Saharan Africa is expected to accelerate from 2.6% in 2009 to 5% in 2010 and 5.5% in 2011 as commodity prices remain high, exports recover and domestic demand accelerates. This strong expansion of regional economic activity is supported by institutional reforms that provide a positive environment for the expansion of private investment. These include a greater commitment to democracy, political stability and the strengthening of institutions of governance; the opening up of African markets to local and foreign competition through reduced trade and investment barriers; and increased investment in national infrastructure to reduce costs and facilitate trade. The prioritisation of spending on health and education in national budgets will also support rising productivity. It is notable that in 2009, real spending on education and health increased in 20 out of 29 low-income regional economies. However, greater economic integration is necessary to harness the full potential of intra-regional trade, and expansion of regional infrastructure networks is required to facilitate faster movement of goods and service between countries at lower cost. Honourable Speaker, we experienced a decline in gross domestic product of 1.8% in 2009 and a loss of employment estimated at close to a million jobs. This was a severe deterioration, despite a continued expansion in government infrastructure spending and the countercyclical monetary and fiscal policy response. Higher commodity prices have contributed to a somewhat more buoyant recovery this year than was anticipated at the time of the February budget. Households have started to spend again as interest rates declined together with lower inflation. Trends in the productive sectors of the economy confirm that output has responded promptly to the recovery in trade and consumer confidence. In the first six months of 2010, manufacturing value added grew by 5.8% compared with the previous year, driven by increased production of motor vehicles, petrochemicals, and basic iron and steel. However, the momentum of growth in manufacturing appears to have slowed in the second half of the year. Output in mining increased by 2.2% during the first half of 2010, and appears to have expanded further in the third quarter. Measures to address regulatory uncertainty in the mining sector are underway, which will in due course contribute to improved investment, taking into account the favourable outlook for commodity prices. Agricultural output declined by 3.2% in 2009, but quarterly growth accelerated in the first half of 2010 due to a bumper maize crop. The construction sector continued to grow during the first six months of 2010, though at a slower pace than in 2009. Public infrastructure projects in progress will in due course lead to further private investment, and a more efficient business environment. The Gautrain project provides a clear example of this, with new business investment seeking to take advantage of the opportunities that come with being located alongside a new public transport system. Similar benefits will flow from road improvements and public transport projects in all our cities and metropolitan areas. As Minister Ndebele and Deputy Minister Cronin will confirm, investments that make it easier for people to get to work are good for both the economy and household living conditions. Retail sales have recovered well since their substantial decline last year, though the pace has slowed since the end of the world cup. We project a moderate recovery in household consumption expenditure, from 2.6% growth this year to about 4% a year over the period ahead, which will lead to some growth and job creation in the retail sector. At this stage, we expect overall growth of 3% in 2010 rising to 3.5% in 2011 and 4.4% by 2013. Employment and private investment are expected to rise gradually as growth accelerates. Growth in real gross fixed capital formation is expected to rise from an estimated 0.8% in 2010 to 5.6% in 2011 and 5.9% by 2013. The slowdown in our economy since 2008 has contributed to a narrowing of the balance of payments current account deficit from over 7% of GDP to an estimated 4.2% this year, which has been comfortably financed by capital inflows. Infrastructure spending combined with a recovery in domestic demand will result in faster growth in imports than exports over the next three years. Capital inflows and a recovery in corporate profits will also lead to higher income payments to global bond and equity investors. The current account deficit is forecast to widen to 5.8% by 2013. Headline CPI inflation has declined to 3.5% for the year to August this year, and is expected to remain below 6% over the next three years, supported by a moderation in food price trends and a relatively buoyant exchange rate. This year has seen two further declines in the Reserve Bank’s repurchase rate to 6% in August – its lowest level since the rate was introduced in 1998. Supply and demand for credit has begun to improve in recent months, as consumer confidence has improved, and over the period ahead lending to businesses for investment and inventory restocking is likely to accelerate. The monetary policy stance will continue to target low and stable inflation to support a more competitive exchange rate and reduced investment costs through lower real interest rates. This will be accompanied by measures to contain inflationary pressures and build competitiveness. Public-sector investment remains the cornerstone of government’s strategy to support higher sustainable economic growth, because it reduces bottlenecks in the economy and draws in private-sector investment. Higher levels of public and private investment are necessary over the medium term to raise the economy’s growth potential and create employment, and also contribute significantly to the countercyclical macroeconomic stance. Private business investment makes up about 60% of gross fixed capital formation, and contributed over half of overall investment growth in 2006 and 2007. Since then, investment has been dominated by public corporations, while private investment and capital spending by government departments have declined. Investment by state-owned enterprises has risen from 1.9% of GDP in 2005 to 5.6% of GDP this year. Private sector companies cut back sharply on expansion plans during the recession, reducing their capital spending by 7% in 2009 and an estimated 2.5% in 2010. Over the period ahead, a more balanced expansion in investment is projected, though state-owned enterprises will continue to play a leading role. To remove bottlenecks and reduce the cost of doing business, the core investment plans of state-owned enterprises remain focused on capacity expansion in electricity, rail, ports and roads with the bulk of spending carried out by Eskom, Transnet and SANRAL. In the energy sector, the integrated resource plan under the oversight of Minister Peters will provide clarity on committed generation projects and the future direction of power generation technology, such as nuclear and renewable energy. The planned increase in generation capacity from the Medupi and Kusile coal-fired stations will be supplemented by independent power producers, initially through direct sales to Eskom, but ultimately through an independent buyer of power. Total infrastructure spending of R811-billion is projected over the MTEF period ahead, of which 40% will be in energy, 26% in transport and 11% in water supply. State-owned enterprises will add over R320-billion to public sector debt over the next three years. Reliable electricity supply, clean water and better transport services have to be paid for over time, and so we will see further rises in tariffs and user charges over the period ahead. These are necessary adjustments, though the fiscus will continue to ensure that basic services are accessible and affordable to all. South Africa’s present economic growth trajectory cannot meet the country’s employment needs. Faster growth is required over an extended period of time to significantly increase labour absorption, reduce high unemployment and achieve a more equitable distribution of income. To achieve 5-million jobs over ten years, we need to seek growth of over 6% a year, together with measures aimed at broadening participation and inclusive development. This is what government’s new growth path proposes, in order to bring about the marked reduction in poverty and inequality that we all seek. To achieve our developmental aims, South Africa needs to promote more rapid job creation through a broad range of policy initiatives. Finally, and underlying all of the above, we know that improvements in public service delivery will depend on better financial management, good governance and disciplined pursuit of agreed service delivery outputs and targets. Minister Davies and colleagues in the economic cluster will also be looking at other measures to support exporters and manufacturers, through our trade facilitation agencies, investment in technology and industrial development zones, and institutions such as the Industrial Development Corporation. We recognise, furthermore, that the value of the rand is a critical challenge i our growth strategy. As in many emerging economies, South African producers are currently under pressure because the strength of the real exchange rate reduces the competitiveness of manufactured exports and lowers the cost of imports. We appreciate that sustained exchange rate overvaluation creates difficulties for many businesses and threatens jobs in some sectors. It can lead to unbalanced growth, widening of the current account deficit and increasing vulnerability to economic shocks. Capital flows to emerging markets have increased steadily over the past decade, supported by favourable growth dynamics, improved credit ratings, greater openness and the development of domestic financial markets. Net private capital flows to emerging economies could reach US$825-billion in 2010, up from US$581-billion in 2009. Fixed income investments will reach a record of US$70-75-billion in 2010. Net capital inflows to South Africa have risen strongly over the past two years, reaching 5.5% of GDP in the first half of 2010 compared with 4.7% in 2009 as a whole. These flows are both structural and cyclical. They derive in part from a need for developed economy pension funds to recoup losses by finding sound longterm and high yielding investments. At the same time, low interest rates in advanced economies are supporting “carry trades” in which investors borrow money at low interest rates and invest in assets that pay higher interest rates. Such short-term investments are inherently volatile. The policy challenge is how to continue to attract the long-term inflows that we need, while minimising the risks of volatile capital movements. The rand has appreciated by 6.6% against the US dollar since December 2009, and by 5.5% against the currencies of our major trading partners. Taking into account that South Africa has higher inflation than its major trading partners, the real effective rand exchange rate, which reflects losses or gains in competitiveness, is now about 12% above its average level for the past decade. This appreciation has occurred despite sustained accumulation of reserves by the Reserve Bank. Since the beginning of 2010, foreign exchange purchases and swap interventions by the National Treasury and the Reserve Bank have amounted to R43-billion. The value of gross foreign exchange reserves stood at US$44.1-billion in September 2010. Emerging market currencies of other commodity producers, such as the Chilean peso, have experienced similar appreciation pressures, while the Brazilian real is even more overvalued. We believe that international cooperation is needed to achieve a more stable international financial environment, as proposed in the recent G20 communiqué. In keeping with this framework, several adjustments to our financial and foreign exchange regulatory arrangements are proposed, while recognising that in some instances measures may need to be strengthened or reversed as circumstances change. The prudential framework for foreign investment by private and public pension funds, including the Government Employees Pension Fund, will be reviewed to support portfolio realignment and offshore diversification, especially within Africa and into other emerging markets. A second draft of regulation 28 of the Pensions Fund Act will be published shortly and will take effect next year. The Reserve Bank will publish details of the proposed exchange control reforms. These measures form part of ongoing efforts to reform South Africa’s prudential framework covering offshore investment by domestic individuals and companies. An increase in foreign assets will reduce South Africa’s external vulnerability through income inflows and by supporting twoway demand for the rand. Reserve accumulation serves as protection of the economy against future shocks, though it cannot directly determine the exchange value of the rand. In several countries, tax measures have been introduced to counter currency appreciation. The effectiveness of these measures is being carefully monitored. Further steps to moderate the impact of capital flows on the South African economy will be considered, drawing on both international experience and assessment of the likely local impact. It is important to stress that the above reforms form part of a broader process to improve and strengthen the financial regulatory system, informed by international coordination efforts led by the G20 and the multilateral Financial Stability Board. Several reforms are required by new international regulatory standards. The Basel Committee on Banking Supervision recently proposed a new framework (known as “Basel III”) for banking supervision. Implementation of the new framework will be led by the Registrar of Banks. Similarly, the Financial Services Board is in the process of strengthening the prudential regime for insurers. Other reforms are drawn from the lessons of the financial crisis, but adapted to our circumstances. In moving towards a “macro-prudential” approach to supervision of financial institutions, the focus falls on assessing and monitoring the strengths and vulnerabilities of the financial system as a whole, in addition to the supervision of individual institutions. In order to achieve this, several institutional changes are proposed. The scope of financial regulation will be extended to cover private pools of capital, over-the-counter markets and credit rating agencies. Detailed proposals on financial sector regulatory reforms are contained in a discussion document entitled Strengthening the Financial Sector to Better Serve South Africa, which National Treasury will release shortly. Honourable Speaker, as the world economy recovers from the global crisis, there is considerable debate about how quickly governments should be closing their budget deficits. Some argue that the recovery will be held back if governments cut expenditure too quickly, while others point to the potentially devastating effects of fiscal default. Many European countries are making sharp budget cuts to maintain sustainability, sometimes resulting in severe social unrest. In South Africa’s circumstances, a careful balance needs to be found between continued real growth in expenditure, while reducing the future interest cost burden on the fiscus, so that expenditure growth can be sustained. Where we have to borrow, we will do so mainly to invest in infrastructure that contributes to building productive capacity. Improved delivery of services also requires that we use resources more efficiently, reduce waste and combat corruption. Our approach is explicitly countercyclical, which means that fiscal consolidation will be phased in without curtailment of core public services and in support of sustainable growth. This is what the G20 refers to as “growth friendly” consolidation. Careful management of the fiscus over the past 16 years has meant that we had room for a budget deficit of 6.7% last year and 5.3% this year, which has brought forward the economic recovery. The proposed budget framework anticipates a narrowing of the deficit to around 3% of GDP by 2013/14, and stabilisation of government debt at about 40% of GDP in 2015/16. Expenditure will continue to grow, though moderately, and revenue is expected to recover relative to GDP. It is nonetheless important to note key lessons from the painful adjustments that the United States and many European countries are undergoing. Fiscal over-commitments can lie buried for decades in pension and social insurance accounts, housing finance arrangements, or unsustainable economic subsidies. When there is continuous growth, the difficulties are deferred and all too easily ignored. But when things go wrong, they can do so with devastating speed. A sound understanding of the long-run trends in revenue, expenditure and public-sector financing is therefore critical, and careful planning of future reforms. The Medium Term Budget Policy Statement notes that real non-interest government expenditure per person has doubled over the past eight years. This was made possible by buoyant growth and revenue, and the declining share of debt service costs in GDP. Government spending on infrastructure and social assistance continued to expand strongly during the economic downturn in 2008 and 2009. Expenditure growth will be slower over the period ahead, averaging real growth of about 3% a year. However, the overall public-sector borrowing requirement is considerably larger than the budget deficit. Mainly because Eskom and Transnet need to borrow to finance large infrastructure expansion plans, overall public sector borrowing will be about 10% of GDP this year, declining to 6% of GDP over the next three years. Honourable Speaker, our fiscal policy framework is fundamentally about ensuring that our wellbeing is not unfairly purchased at the expense of future generations. Where we introduce programmes that raise the level of government spending, we need to be clear about how the required revenue will be raised, and at what cost to the productive sectors of our economy. To assist in our understanding of the underlying principles, I have asked the National Treasury to prepare a paper on fiscal guidelines for wider discussion early next year. Honourable Speaker, I am very mindful that the new legislative arrangements for money bills has brought additional responsibilities to Parliament’s portfolio committees, and the Appropriations Committees in particular. We welcome the first Budget Review and Recommendation Reports, which have been tabled over the past week. Several concerns raised by portfolio committees will need to be explored further – underspending on climate change initiatives, noted by the Committee on Water and the Environment, for example, and the need to improve oversight of the expanded public works programme, recommended by the Public Works Committee. I have taken special note of this Committee’s observation that the department cannot be expected to budget for state funerals, as these cannot be accurately predicted. I am sure that Minister Doidge and I can find a way of dealing with this. I am pleased to be able to table a comprehensive Adjusted Estimates of National Expenditure to accompany the Adjustments Appropriation Bill and – for the first time – a Division of Revenue Amendment Bill, for the consideration of the House. I cannot deal with all the adjustments in detail, but let me highlight the main points. In total, the adjusted expenditure level is R2.5-billion lower than the February budget estimate, which included an unallocated contingency reserve of R6-billion. Contributing to this decrease is a lower provision for state debt costs due to the current strength of the rand and the decrease in interest rates, and savings declared by departments amounting to almost R2-billion. R100-million to scale up HIV and Aids prevention services. Chapter 4 of the Medium Term Budget Policy Statement summarises the spending framework for the period ahead, informed by government’s 12 agreed outcomes, with priority given to education, health, infrastructure development and job creation. Effective training programmes need to be strengthened across the public service. A new approach to budgeting and management of capital projects will be introduced, together with technical assistance to departments and municipalities in which there is under-spending on infrastructure maintenance. Non-departmental agencies and entities are under review, with special focus on governance, remuneration and mandates. Strengthened capacity is in place to deal with wrongdoing in government procurement, and improved rules will enhance transparency in the supply chain process. Information technology systems and management of consulting services will come under specialised scrutiny within the supply chain regulatory framework. Preparation of the 2011 Budget is now well underway. Cabinet has agreed to a preliminary framework for the MTEF period ahead that makes available R67-billion more than the baseline tabled in February this year, of which R40-billion goes to provinces, R24-billion to national departments and R3-billion to municipalities. A further R22-billion remains unallocated to departments at this stage, and is set aside for key education, health, infrastructure and job creation commitments. Proposals for expanding youth employment opportunities will enjoy special priority. And in reflecting on opportunities for our youth, let me congratulate the students of Belgravia High School who are with us in the gallery, and who were the winners in three consecutive regional quiz competitions. We should also take this opportunity to wish all matric students well in the examinations which will shortly begin. The Medium Term Budget Policy Statement sets out broad policy considerations underlying the expenditure proposals, including government’s economic and industrial policy framework, the need to strengthen infrastructure maintenance, land and agrarian reform goals, pressing needs in education and health service delivery and the challenges of improving police services and the administration of justice. Several critical long-term public expenditure pressures need to be addressed systematically over the period ahead. First, we have to complete the reform of social security arrangements that has been under discussion for since the 2002 Taylor Committee Report. A key aim is improved preservation of savings for retirement among working South Africans. Consolidation of the fragmented existing administrative arrangements for social security is also a priority. Second, we have to implement a National Health Insurance system. The first phase will involve improved primary health services in rural areas and under-served communities, and an expanded programme of hospital construction and revitalisation. An inter-Ministerial committee has met to consider the fiscal and financial implications of further health financing reforms, and will develop practical transition proposals. Third, we have to improve the maintenance of our transport infrastructure and networks, and invest in modern public transport systems. Fourth, we have to provide for the fiscal contribution to new growth initiatives, industrial development and job creation. These are major social and economic reform projects, which will require substantial fiscal and financial reforms, phased in over many years. If we are to make rapid progress in these transformation programmes, it is imperative that equally rapid progress is made in reducing wastage and inefficiency elsewhere, and in improving financial management and governance. Honourable Speaker, our spending programmes have to be paid for. It is therefore reassuring to be able to note that the improved economic performance has contributed to a projected increase of R31-billion in tax revenue for the current year, by comparison with the February budget estimate. Total tax revenue is expected to amount to R679-billion in 2010/11, or 25.35 of GDP. A strong increase in VAT proceeds has been recorded, partly attributable to buoyant consumer demand, but also because of lower capital investment and the associated reduction in VAT refunds. Customs duty collections have improved, mainly as a result of higher vehicle and component imports. For the period ahead, tax revenue is expected to average about 265 of GDP – still somewhat below the levels recorded before the recession. Consolidated government revenue, including social security funds and public entity revenue, will recover to about 29% of GDP. I need to remind Members of the House that today marks the start of the final month of Tax Season 2010 for non-provisional taxpayers whose returns are due by 26 November. I urge all taxpayers who have not yet filed to do so within the next 30 days and to join the 2.6-million taxpayers who have to date submitted their returns. This is an 18% increase in compliance and early filing compared with last year. This growth in compliance comes despite the difficult economic conditions in which all South Africans find themselves and reflects the strong foundation of tax morality which has been laid and continues to take root and grow within our country. Let me therefore applaud the many millions of our country’s taxpayers who respect their side of the social contract which has allowed us to continue our vital social and infrastructural investment without over-burdening ourselves and future generations with unmanageable levels of debt. Our capacity to pursue those who seek to evade tax obligations continues to be reinforced. Tax authorities the world over are co-operating more than ever before to throw open the veil of tax manipulation. South Africa has double taxation agreements with 70 jurisdictions which provide for extensive exchange of information between tax authorities. In addition, tax information exchange agreements have been agreed at officials’ level with six financial centres and a further sixteen agreements are being explored. A joint audit made possible through these agreements has already yielded R3-billion in additional revenue. Combined with the growing availability and accuracy of third party data from financial institutions, employers and other sources, there are very few places for the non-compliant to hide. We are, however, offering another opportunity for taxpayers to come clean and join the ranks of full participation in our democracy. The Voluntary Disclosure Programme, which allows for the waiving of penalties of up to 200% for those who make a full, honest and voluntarily disclosure of prior evasion, will begin next month. chain management and ensuring value for money in government procurement of goods and services. The National Treasury has been working closely with other departments and agencies to combat fraud and corruption, under the leadership of the Inter- Ministerial Committee on Anti-Corruption chaired by Minister Chabane. This has already yielded several positive outcomes, but more has to be done. Procurement and tender fraud to the value of nearly R25-billion is currently under investigation. Our approach comprises the following five initiatives, which will include legislative and regulatory reforms. We will be increasing the monitoring capability of government, aimed at early detection of fraud. Departments and government agencies will be required to provide specific information to the Treasuries on their procurement practices. Where necessary, the cash disbursements process of government agencies will be temporarily assumed by Treasuries thereby ensuring that only valid contracts are honoured and government is charged a fair price. In line with international best practice, transparent public disclosure will be required at each stage of the supply process, in all spheres of government, including reasons for award decisions. Government will look holistically at identifying procurement requirements that could be better managed centrally, such as the use of transversal contracts for the acquisition of high value and complex goods and services. Stiff penalties are proposed, of up to double the contract value, for service providers who obtain government contracts fraudulently. Public officials who assist in tender fraud will also be liable for resultant losses incurred by government. Measures are required to ensure that officials who have breached the buying rules should not remain under suspension, drawing full benefits, while investigations drag on for years. Tax compliance measures associated with government procurement will be strengthened. The introduction of a withholding tax on payments made to businesses in respect of government tenders is under consideration. It is also proposed that the procedures for issue of tax clearance certificates should be revised, to provide for direct checking by SARS of the tax compliance of winning bidders rather than pre-clearance of all bidders. Members of the House will have heard through the media about the arrest of prominent business people, senior government officials including former heads of departments. Members will also be pleased to know that the government was awarded preservation orders worth about R200-million which included a lear jet, a golf course, a holiday home and a hotel. This is the result of cooperation and coordination of efforts between several investigative agencies. As a result of these efforts, Honourable Speaker, we are beginning to see a change of attitude on the part of service providers. In a recent case, a firm which was paid R10-million by a department for work that they had not done, voluntarily returned the money to the fiscus. Honourable Speaker, we will turn the tide on corruption and fraud: We will ensure that tax funds and government monies are spent wisely and managed with integrity. We owe this to our honest citizens and responsible taxpayers. To promote a development-oriented public service and inclusive citizenship. In elaborating the policies and programmes needed to give effect to these outcomes, we have a special opportunity to forge a broad-based social compact – a shared social and economic vision – aimed at effective partnerships between government, business, labour, communities and civil society, in pursuit of common goals. Cabinet has agreed on a growth path that sets a target of creating 5-million jobs in the next ten years, through efforts that require commitment and cooperation between all spheres of government, business, organised labour and community partners. Honourable Speaker, allow me to express my appreciation to President Zuma for his sound leadership, and to Deputy President Motlanthe for valued guidance. I am grateful for the support of the Ministers Committee on the Budget, members of the Treasury Committee, Cabinet colleagues, Premiers and provincial finance MECs, during a year of considerable financial strain, and a budget process that still has some way to go. The Auditor-General, Terence Nombembe, and his staff, bring a professional spotlight to bear on all of our work, and I know that the House will join me in expressing our admiration and thanks. I would also like to commend Mr Thaba Mufamadi, Mr Mshiyeni Sogoni, and Mr Charel de Beer and Mr Teboho Chaane, who chair the standing committees on finance and appropriations, and the select committee on finance, who have more onerous duties now that new Parliamentary budget procedures are being introduced. The Governor of the South African Reserve Bank, Ms Gill Marcus, has brought astute leadership in difficult times. Mr Oupa Magashula and the staff of South African Revenue Service continue to bring innovation and energy to the collection of taxes on our behalf. I would like to thank Deputy Minister Nhlanhla Nene for his tireless support and insight. Director-General Lesetja Kganyago and the National Treasury team have once again delivered a set of budget statements on time, though not perhaps within an affordable and efficient word count. Honourable Speaker, I hereby submit the 2010 Medium Term Budget Policy Statement, and I table the Adjustments Appropriation Bill, the Division of Revenue Amendment Bill and the Adjusted Estimates of National Expenditure, for consideration by Parliament.